Dark Hardwood vs Light Hardwood. Which is Better? What is the style of your home/décor? What type of traffic do your floors get-kids or pets? What size are your rooms and do they get plenty of light? What goes best with your cabinetry? The truth is, when it comes to hardwood floors, there is no one size fits all. Depending on how you answered the questions above, dark or light hardwood may be the better choice. 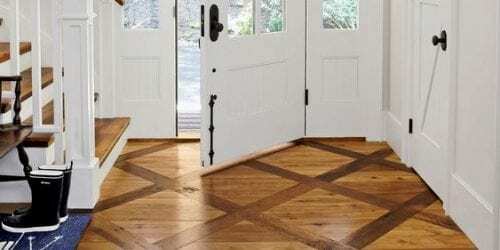 You can also create statement floors like the one below for the best of both worlds. Light Hardwood Floors are easier to keep clean as they do not show dirt as much as dark wood floors. 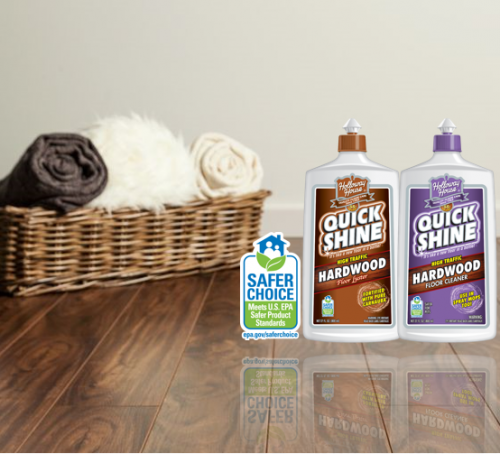 We recommend using our Quick Shine® Hardwood Floor Cleaner to damp mop your floors. Our pH neutral formula will not leave behind streaks or residue that can dull floors over time. Light Hardwood Floors show less scratches than dark hardwood. A great way to fill in surface scratches is with our Quick Shine® Hardwood Floor Luster. This product will bring life back to dull, worn out floors. Don’t Refinish It. Quick Shine® It! Dark floors do you make your space a bit smaller and light floors make the space look a bit larger. However, it is really the combo of colors on the floors and walls that give the total impression, and there is more wall space than floor space. Try using a lighter paint color if you have dark hardwood floors. Dark floors tend to work better in homes with larger rooms and open floor plans. A great way to see which hardwood floor will look best is by bringing a few floor samples home and place them near cabinets, walls and furniture. You can really get a feel for dark or light wood and the atmosphere it will create. Once you have chosen the right wood floor for your home, look no further than our Quick Shine® Premium Floor Care Products for a healthier, happier home.